For the past month or two, I spent on planning and building my first Mini PC. It wasn’t smooth sailing by any means, though the only hiccup I had was to do with the motherboard, which needed replacement because of graphics artefacts. At home, we have a desktop PC, an old laptop and a MacBook. Two questions might immediately come to one's mind. Why do I need a Mini PC and what are the reasons behind wanting to build one? Here is why? I needed a PC in my living room for the simple reason that there is so much multimedia content on the internet (like movies, Youtube, BBC iPlayer, Hulu ...), which are better off watching on a larger screen in the comfort of a sofa, rather than watching on a desktop PC or even a laptop. Spending hours in front of a PC to watch movies doesn’t sound appealing, especially if it involves an entire family wanting to watch the same movie. Furthermore, I needed a device to record digital TV programs which could be edited and used for personal use. Though Sky+ is an alternative in the UK, it is not easy to transfer the recordings onto a PC. Next comes the question, why build one? I initially was tempted to buy a Acer Revo R3610. It was costing around £250. However, reading buyers views, it became apparent that this machine with its small foot print wouldn't be able to deliver the graphics capability I was looking for. Furthermore, I wanted a device with a DVD-RW to play and record media content. I looked at few other alternatives and the one which caught my eye was Dell Zino HD. Though Dell Zino HD's spec looked great, its processor capability was below par. The buyers views weren't positive either. Even if I were to overlook its shortcomings, the device would cost a cool £530. As it costs upward of £500 for a half decent mini PC, I thought I may as well build something that was more powerful, but cheaper. I looked around on the internet and found mini-itx.com online store, which was selling various components needed to build a mini PC. It also gave suggestions on aspects like which cases would fit a particular mini-itx motherboard, etc,. Gleaning through the website, I found Zotac GF9300 I-E LGA 775 motherboard, which I felt was the perfect choice for building a mini PC, especially with its capability to deliver high-definition video playback. Here is a picture of the Motherboard, courtesy Zotac Website. It costed me approximately £490 to source the components. Let me remind that the above cost is minus the operating system. If one were to go with a free operating system like Linux, then that is the price one would have to shelve out to build a mini-ITX PC with above build. The above build is as good as one could expect in the small foot print of a mini-ITX with a LGA775 board. Now let's come to the actual build process itself. Order the components as suggested above. It is likely that you could source the components from just one seller like Scan Computers, to optimize the price. Find a large enough desk with plenty of room around it to build the mini-ITX PC. Ensure that there is sufficient light over the table. Put on your Anti-static wrist strap. Prepare the case. Jou-Jye website contains instructions for Standard Assembly which are quite useful on how to prepare the case. Ensure that all the components in the case, except the in-built PSU are removed. This includes the I/O plate at the back and the front panel cover. Put the I/O plate supplied by the motherboard in the case. Place the case aside for the moment. Take out the Zotac Motherboard and place it on the Anti Static bag it comes with. Now take out the Intel Processor from its box and by following the instructions on the Intel website place it on the motherboard in its designated location. Take care not to touch the gold contacts on the bottom side. Retain the protective covering from the load plate, in case you need to take the processor out in the future. Screw the Wifi card onto the motherboard. Place the Zotac Motherboard into the case and screw it. Jou Jye case is quite a compact case and could take some dexterity to place the motherboard. Punch holes on the I/O Plate need to be removed to enable the Wifi kit to fit in. Once in place, screw in the Wifi aerial. Following the instructions on the Intel website mentioned above in Step 3 and place the fan onto the processor. Take care to place the fan in a manner that the plastic tab holding the power cable doesn't face the GPU cooler. The experience from other users is, this may lead to heating of the plastic tab causing abnormal rise in the GPU temperature. Placing the fan correctly is the second most important step (after placing the processor) in the process of building a mini PC. Improper alignment of the fan could lead to rapid increase in processor temperatures, which could eventually cause failure. Once the fan is slotted in twist and turn to see whether the fan is secured properly. If properly secured, it is possible to remove and place the motherboard with the fan, in case any problem arises in the future. Slot in the Memory module onto the motherboard, taking care not to force it in. The retainer clips will give a click sound once it is slotted in properly. Screw the Slimline DVD-RW and Hard Drive onto the support plates, using the Standard Assembly instructions mentioned in Step 2. Do not screw them just yet onto the case. Now connect the power connectors to the motherboard. This includes the 20+4 ATX power connector to supply power to the motherboard, 4 pin ATX 12V Power connector to supply power to the processor and the CPU fan connector to supply power to the fan. Also connect the Wifi card to the USB connector. Following the instructions in the Zotac manual to make connections to the Front Panel header. This includes, Power switch, Power LED, HDD LED and Speaker header. Also connect the AC97 front audio header. You are now almost on the home stretch. Connect the SATA/Serial ATA Combo Power Data Cable Molex end to the Molex connector. Connect the SATA end of the cable to the 2nd SATA connector, leaving the first one for the Hard Drive. Using the SATA cable provided with the Motherboard connect one end to the 1st SATA connector. Place the plate for supporting the DVD-RW and Hard Drive. Now slowly place the DVD-RW and Hard Drive Support Plate into the Case. Screw them securely. Connect the other end of SATA connector of the 1st SATA into the Hard Drive. Next connect the power supply to the Hard Disk. Also connect the Combo Power Data Cable into the DVD-RW. It is advisable to remove the front panel of the Slimline DVD-RW while putting in the case. Once the whole thing is in place, put the top cover of the case and screw it. Put the front panel for the Slimline DVD-RW. Finally, place the front panel for the case. You are now ready to power the mini PC. 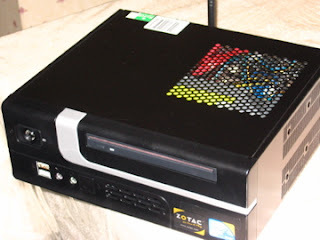 If things are followed as per the instructions above, you will once powered and connected to the LCD TV via a HDMI cable, you will see the ZOTAC POST. Enter the BIOS settings and change the Boot order to let the DVD-RW to be the primary Boot device. Save and exit. You PC is now ready for OS installation. I am really happy with this build of the mini PC. At the end of it all it gives immense satisfaction to see the thing work like a treat. Here are a few pictures of the completely Assembled system. The Windows Experience Index of the system in Windows 7 is 4.6, which is quite creditable for a mini PC. The chart shows that the temperatures are quite ok, indicating that the air flow through the case is good. How much ever planning you do, there will still be something unexpected that could happen. The motherboard I got was faulty. When I tried to install the operating system (Windows 7 and Ubuntu Karmic), the graphics froze on more than a few occasions. I spent atleast a week troubleshooting. My two children, who were keenly following the progress of the build process were on the verge of giving up the whole thing. The various forums I went onto were of little help. Ultimately, Zotac support informed that the problem could be due to graphics artefacts. I sent back the Motherboard to CCL computers, who promptly replaced it with a new motherboard, which, touchwood is still working. One thing that came up on the forums was 220W PSU may not be sufficient. Though Intel Q8300 Core2 Quad processor power consumption is a touch on the higher side, I can now say for sure that 220W is more than adequate for a similar build mini PC. While reinstalling the processor and the fan, it is likely that the thermal interface material (TIM) on the bottom of the fan would be inadequate for a second use. I called up Intel support to get the thermal interface material for free. I followed the instructions on the Intel website on how to clean the existing TIM and reapply it.